T his week, we're having a very cool giveaway on MOMocrats. 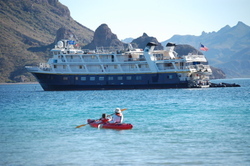 Come on over and check it out! You can enter anytime between now and Thursday, May 1 at noon Pacific Time. 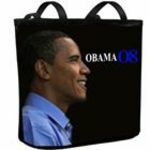 You know you want that Barack Obama purse from Snaptotes, now don't you? 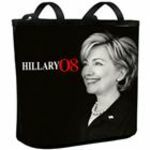 Or the Hillary Clinton clutch? Totally cute and will match almost any outfit. Tonight, I'm meeting California First Lady, Maria Shriver. I'll report in tomorrow on how it goes. Thanks to my pals at Silicon Valley Moms Blog for arranging this meeting! Dear George Stephanopoulos, When Did You Become Such a Tool? Hey! Remember me? We went to college together. We met on a very unfortunate blind date, which I think ended with you calling me a communist and me calling you something that rhymes with "ick". Bygones, I hope. Still, as I got to know you a little in college from our intersecting circles of friends, I started to think that you were probably one of the brightest people I knew in a college full of brainiacs. I mean, dude, Barack Obama himself graduated the year I did, one year after you. Did you know him? I didn't, but I imagine the two of you furiously debating during Zbigniew Brzezinski's honors seminar on Cold War Politics or having a brewski at the West End. Maybe not. I watched your career with interest, from your creation of the now archetypal preppy-but-earnest Presidential aide (Michael J. Fox played you to Michael Douglas' President in some movie or another), to reading your book about how the Clintons made you turn to antidepressants and C-list actresses for comfort, to your rise through the TV news ranks from cub reporter to Sunday morning show host. I've always told people with a little bit of pride, "I knew that guy when he was just a short Greek guy with good hair and a lot of ambition." Deviating from being generally ticked off about politics for a moment to share something fun. Thanks to Mochamomma for the link to this fun video. If you want to read my take on the Obama flap, you can read it here. If you happen to live in Anna Eshoo's Congressional District in California, today (Sunday, April 12) is the day you vote for delegates to the Democratic National Convention. If you're an Obama supporter, please come out and support Julie Lythcott-Haims, a mom of two from our community who is a tireless Obama volunteer and really deserves to go and represent. I'd love to see her get the nod from our district! Information on where and when is at the California Democratic Party site. For those of you who live in the Bay Area, please come out to the Bone Marrow Drive on April 19 in Palo Alto. My dear friends, Jill Asher and Pamela Hornik are organizing this drive through the National Marrow Donor Program to help people who are waiting for bone marrow transplants. It is particularly important to raise awareness in minority communities, where the need is great and the supply is low. I was recently named to a list of the "50 Best Mom Blogs" by Teens Today with Vanessa Van Petten. Vanessa is a young woman writes a terrific blog for moms of teens and wrote a book called You're Grounded: How to Stop Fighting and Make the Teenage Years Easier. Her book and blog are a guide for parents on communicating with teens, written from a teen's perspective. I've going to need this book a few years down the road. Thanks, Vanessa! Last week, I was honored to be among a terrific group of mombloggers attending Camp Baby. I'll be posting some thoughts on that event over at my review site, The Silent I Speaks. Until I get around to it, read fellow Camp Baby alum Erika's account over at Plain Jane Mom. She pretty much sums up the experience the way I would. In a word: Kegel. Friday night I went up to San Francisco to meet the world famous Bossy of iambossy. She is a lovely, charming person, and I hope she makes good on her notion to move to San Francisco. She's currently on a roadtrip across the country, meeting bloggers and spreading the Bossy love. She stayed at CityMama's house, and we had a great party at BadKitty's place in SF. I had the privilege of attending a fundraiser for Barack Obama in San Francisco on Sunday night, and came away with a renewed feeling of optimism and hope that this man could be our next President. I was on the fence between Hillary and Barack for a long time, after the crushing blow of John Edwards' withdrawal from the race. 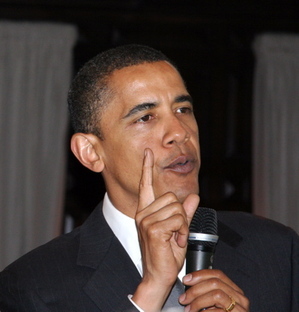 I now know that if Barack wins the nomination, he will go all the way. Frank, Alex and I drove up to a gorgeous home in San Francisco, and were met with a long line of well-dressed Northern Californians who were all excited to meet Obama. We met our hosts at the door, a real estate developer and his lovely wife. There were about 300 people in attendance, all crowded into the downstairs living room, dining room, and foyer, munching on appetizers and drinking wine. When Obama's motorcade (actually, two giant champagne-colored Suburbans) arrived, we all had to squeeze together and back up to make way for him to come through the crowd without freaking out the Secret Service. My son, Alex, met a 9 year old girl at the event and the two of them weaseled their way up to the front to position themselves at the bottom of the staircase that Obama was use to make his entrance. The Secret Service stoically stood by, eyeing the crowd and talking into their sleeves from time to time, and the crowd was calm, but excited. Frank, Alex & I were fortunate enough to attend a fundraiser for Barack Obama in San Francisco last night, at a private home. 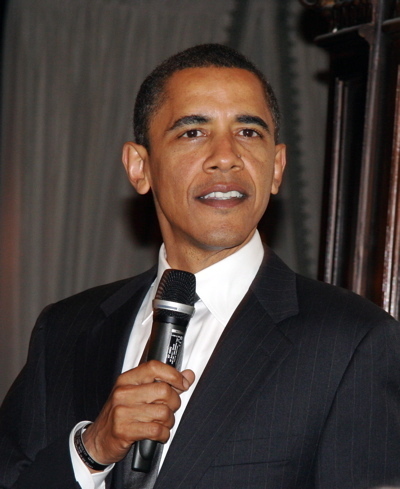 Obama gave a terrific speech, and was much more warm and engaging that he seems on TV or in a large crowd. The house was jam-packed with supporters, but Alex positioned himself to get to shake hands with the future President. I didn't get a shot of that, but it didn't matter. I don't think it's something he will forget. I have more pictures and videos to share, and will post more on this later. I came away from the event feeling as though I had voted for the right person. Photo by Glennia, All Rights Reserved. California Democratic Convention: Who Wants to Be Governor of California? 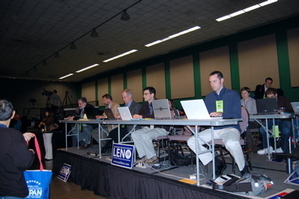 I spent the past weekend attending the California Democratic Convention. On the first full day of the Convention, I made my way into the big hall, bright green "INTERNET MEDIA" press pass dangling from my neck, wondering who was going to stop me and tell me that it was off-limits. I thought as lowlife bloggers, we'd be shuttled into a windowless, cinderblock sideroom where we would watch the action from a portable Zenith black & white television set with rabbit ears. Instead, I was told to go sit on a platform at the back of the room, with a great view of the stage, above he heads of the delegates in the crowd, right beside the TV news crews from CBS, CNN, and other major networks. I found a seat in the back row of the blogger ghetto, and opened up my laptop. As I was sitting there, about a half dozen or more people representing various causes and candidates came by to hand me literature, asking if I would write about their causes. A guy with a firm handshake with the made-for-politics name of Joe Nation, candidate for State Senate, came by to talk to the bloggers. He said that he bought carbon off-sets to neutralize the entire Bay Area delegation's carbon footprint for the convention. He seemed like a very nice guy, but one of the bloggers kicked him off the blogger platform and said that the area was for press only.